So why does anyone use WWW in front of a website address (technically website address is called a URL but for simplicity, I’m calling it a website address in this post.) ? If you’ve used a computer anytime in the past 30 years, you’ve probably asked yourself — What is up with so many website addresses starting with WWW. – The Triple Dub. Well I’m going to tell you. First of all you should know that beginning a website address with WWW is completely unnecessary. And when you set up a website there is nothing that says — nice website, buddy, but the law says you this website has to be accessible both with and also without the W’s in front. That’s just not true. 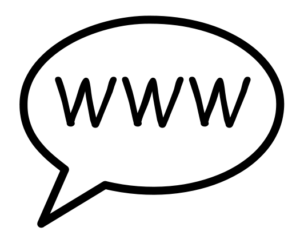 The WWW is actually called a subdomain of the original domain — a subdomain of the version without the W’s. And what’s more, you could rename the WWWs to anything you wanted and create a whole new website to go with it. Google does this all the time. For instance, maps.google.com is the address that leads to Google Maps. And inbox.google.com leads to your Gmail Inbox. But long ago when the web was new, people started using WWW in front of a website name to tell people that when they saw something that started with WWW – that this was indeed a website and could be typed into a browser in order to pull up the advertised information, — As In: Find me on the web at www.websitesabq.com — It is expected of web masters these days that no matter what address you advertise, that you should have a subdomain of WWW to point to your web page as well as having the main domain (without the WWW) go to the same page. It just makes it easier to be found. And usually web masters want their websites to be easy to find. When you set up a website, you decide which version of the address you will use. If you choose to go with the WWW, then when someone goes to websitesabq.com, they will get sent to www.websitesabq.com automatically. And you can see that you have been redirected by looking at your web browser’s address bar. In my case, I made a choice as the web master of this site to send people to the WWW version. And there is no best choice for this. When I set up this site I did what Google did and decided to include the WWW. So that’s it. That’s the big secret. It’s just a tradition that truthfully has outlasted its usefulness. Web masters are silently sending people to the same location whether they use WWW or not. And a lot like the American penny, its not really very useful anymore, people have just gotten used to it. So if anyone asks you what the W’s are for, now you know.